Also, if anyone has a photo of the Big Pine sign, I’d sure like a copy! My most fond memory of dancing happened in the mid-1970s, after I’d returned to Boise from my roaming days and when I was a student at Boise State. 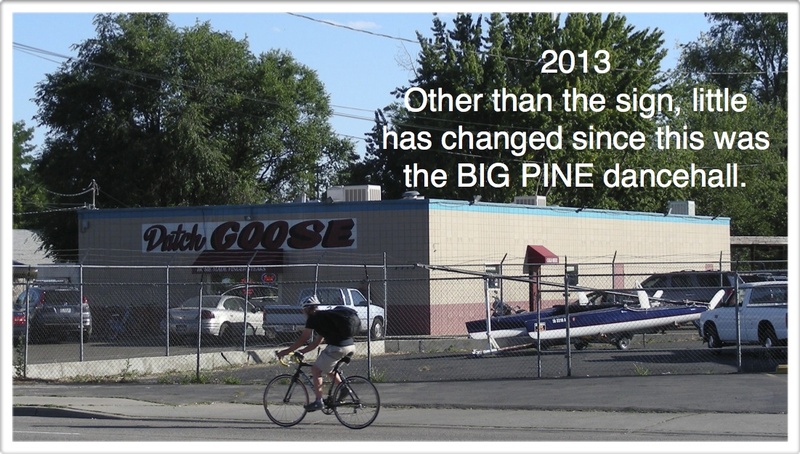 It happened at the Big Pine Tavern, now the Dutch Goose, near 36th and State in Boise. It is within blocks of where I grew up. Two friends and I, Dorothy Burrows and Bev Fickle, spent many nights at dance haunts all over Boise. I was also a member of new theater troupe, Theatre in a Trunk, organized by Randy Krawl. Randy’s parents and he were a dance band with a weekly gig rocking out the Big Pine, so Dorothy, Bev and I went to check it out. The Big Pine lived up to its name—a huge room, the front third dedicated to a bar and pool tables and one COLOR TV for when a game was on one of the four channels we had back then. The back two-thirds of the bar was mostly dance floor, with tables stuffed around the sides and a small stage at the far end. As was the custom, the place reeked of stale smoke and beer but soon the sweat from overcrowded dancers canceled that out. The Krawl family band played the classics, leaning toward western and occasionally rocking the floor with a fast rock tune played to keep the “kids” happy. The floor was always packed and behaved like old-fashioned dance floors did, where everyone danced in a huge circle, two steps forward, one back, creating a gyre slowly moving counter clockwise if viewed from above. Fast or slow, swinging or holding tight, everyone kept pace with everyone else as the floor rotated to the music. And the floor was filled with every age. Eighty year olds were dancing with their sweethearts, possibly from high school. Parents danced and teenagers danced. It was not unusual for an oldster to mention, “You sure can keep up with that,” as we kids were returning from the nightly rendition of Wipe Out. Nor was it unusual for we kids to tell the oldsters how smooth and fine they looked as they returned from a song we had heard back when mom and dad were watching Lawrence Welk. But for the most part we were all dancing to all the tunes. It was a family of humans sharing our common bond. It was, indeed, a stomp, just as I had remembered the dances from my childhood. And it happened every weekend. Dorothy and Bev and I became regulars and we began bringing friends. One of those crowded Big Pine nights our table had grown to seven or eight and I was making sure all the ladies had their turns on the floor, including a newcomer who had been talked into joining us by friends of friends. She was a lovely dancer, catching every dip and feeling free to let me know what her feet were in the mood for. By the third dance we were sliding through every hole between dancers, finding our own room for moves large and small. Like silk in the breeze, we responded to every tweaked hip and flipped foot and dipped shoulder. There was no leading and no following. The music filled us both and we both responded exactly the same way. I remembered the Stanley Stomp from my childhood. It was deja vu all over again. And, yea, we talked. She was in town, studying. She was moving back to where she’d come from, back to eastern Idaho. We danced and I thought about it. And I felt it. The next time we were on the floor I put my arm across her back, holding her beside me as we strolled forward to the beat of an easy Western twang. For the first time I felt her step faultier. I swung her into myself, left hand raised, swaying in the classic posture. Everyone else had to dance by. She couldn’t move and I didn’t want to. Then, simultaneously, our feet caught a beat and, once again, we danced the night away. This entry was posted in Dancing #1 and tagged Big Pine, Rexberg, State Street, Third dance on July 14, 2013 by deansgreatwahoo. Really? Was this? The same girl? I’m on tenterhooks. ? Never spelled that word before and it doesn’t look right. The only time I went to a real stomp was when I went with my first hubby to his old stomping grounds in northeastern Wyoming. I think we were in Moorecroft, or was it Newcastle? Tiny rural town that had only one place big enough to hold everyone and that was the church. They pushed all the chairs to the sides and cleared the floor and everyone danced with everyone. Little kids, big kids, everyone. When the kids pooped out, they crawled up to the pulpit and sacked out in the dark corners. The party lasted till the wee hours and just cuz it was in a church didn’t mean it was dry. There was plenty of booze out in the parking lot. What a blast. That’s right, Rangewriter. It was the same girl and we recognized one another only through our dancing. It was quite special. Lovely. There is a difference between stomps and dances, aren’t there? Even so I find we can blur the lines at will. That is just the coolest story ever.